I had no idea Satyajit Ray had written fiction until I was recommended this book last year. It instantly featured in every book hunt of mine, but was quite hard to find in this country. But I spotted it when I least expected, and enjoyed my time reading it. This book is a collection of short stories very reminiscent of Roald Dahl’s stories - they all explore human oddities, and the bizarre realm of the supernatural. I loved that Ray concentrated on India’s mysticism. Every story explores the ambiguities and mysteries surrounding our traditions, beliefs and numerous mythological occurrences. Starting from Ayurveda to our fascination with holy men, the deification of King Cobras, to the mythologies and mysteries fogging the surreal Manasarovar, Ray handles every story from both a rational (i.e., scientific) as well as a super-natural perspective. Through these stories, he reminds us of how richly intricate India is, and how it teems with so many mysteries that all boil down to life’s fundamental questions. Ray’s characters are simple, yet very memorable, especially the recurrent character, Professor Shonku. Professor Shonku is an ingenious scientist whose diary contains his fabulous and incredulous scientific innovations and adventures. 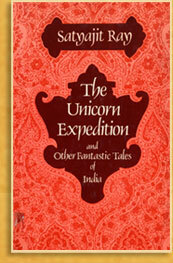 I absolutely loved the scientific explorations of the supernatural (such as embarking on an expedition to find Unicorns! ), as well as the future directions of science and Artificial Intelligence. Satyajit Ray was most definitely ahead of his time. His movies demonstrate his imagination, creativity and insight into the human-psyche, and his stories reflect the depth of his thoughts, and the wisdom in them. For example, I have recently been hearing and reading quite a lot about the intelligence of crows! Yes, crows! Not chimps, but birds that have been paid the least attention in regards to their possible intelligence. To those of you who are interested, here is a short TED video of the pioneer crow-intelligence researcher :). Reminds me of the old story about a crow trying to drink water from the bottom of a pitcher! Yet, one of Ray’s stories written decades before, is on Professor Shonku’s experiments on training a crow to be intelligent! Ray’s prose is very lucid and precise. The content of the stories were well oiled, so to speak, because of the impeccable and clear writing. Digested thoughts: I thoroughly enjoyed reading Ray’s imaginative, diverse and mystical stories. I particularly liked Professor Shonku’s science-fiction adventures. The stories are well-written, and although they were written for children and young-adults, I think they will appeal to adults as well. This sounds like such a fun book- it combines so many of my favorite things :). Wish I could borrow it! I will remember to bring it with me the next time we meet :). Ah yes, I am envious of birds and insects for being able to see other colors! wow, I had no idea Satyajit Ray had written too! This sounds very interesting. Hope I can lay my hands on it some day. I haven't read this one, but remember reading one called 'The incredible adventures of professor Shonku', which I enjoyed very much! Wasnt aware that there are more pieces featuring Shonku:-)Will try get hold of this. I have read this book and I loved it. I think Satyajit Ray is a wonderful story teller. Sanjini, thanks for the recommendation!